Ping Reset to reboot any IP device! Ping Reset will allow you to reset any IP device in your traffic cabinet. The RocketLinx ES8510-XT is a managed industrial Ethernet switch, equipped with seven 10/100TX ports and three 10/100/100 RJ45/100-FX/Gigabit SX/LX/LHX/ZX/SFP combo ports. Two Gigabit ports may be used to form a non-stop Redundant Ring while the third Gigabit port enables connection to an upper switch, couple ring, or public server. The Gigabit combo port design provides flexibility to choose copper or fiber media supporting 100BASE-FX or 1000BASE-X, Multi-Mode or Single-Mode for a wide variety of distance and installation requirements. RocketLinx Features – Ping Reset to Reboot ANY IP Device! MINNEAPOLIS, Minnesota — January 14, 2014 — Comtrol Corporation today announced that its RocketLinx ES8509-XT industrial Gigabit Ethernet switch passed IPv6 conformance testing and now carries the IPv6 Ready Logo indicating full compliance with IPv6 networking standards. As of January 2014, Comtrol’s complete line of managed RocketLinx switches includes support for IPv6, the replacement for the current IPv4 Internet protocol. IPv6 improves both security and performance while responding to the immediate shortage of IPv4 addresses. 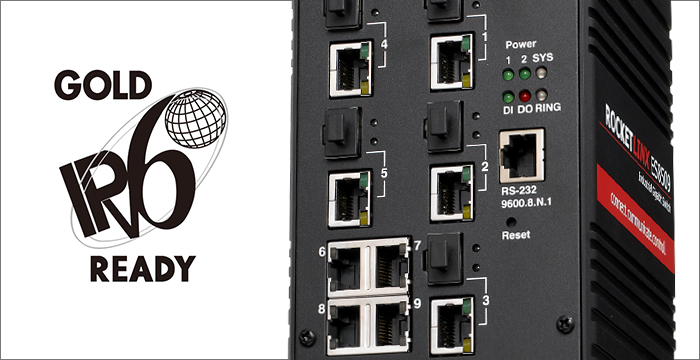 The ES8509-XT is the first in Comtrol’s RocketLinx series to be tested and awarded the IPv6 Ready Logo for compliance with the IPv6 core protocols. WANT THIS IN AN EMAIL? Subscribe via the button in the top right corner of our homepage! As a communications equipment manufacturer, Comtrol often suggests applicable products for a customer’s environment based on features the products have. However, this is a two way street. 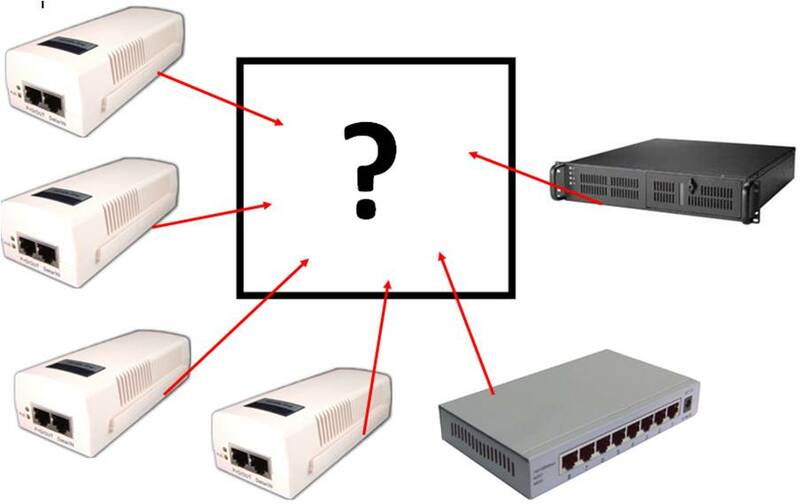 The proper selection of an Ethernet switch begins with classification of the area in which your product will be placed; only next does it become important to select a switch that fits your environment. Step 1 – Classify the area in which your network equipment will be located. Step 2 – Select an Ethernet switch that meets the requirements of the area it will be located. Now that the environment has been classified, the next step is to find an Ethernet switch, or set of Ethernet switches that meets or exceeds each of the characteristics defined by the environment. By listing environmental specifications on every Comtrol RocketLinx Ethernet switch, this step can be as easy as completing a check list. Comtrol Corporation, today announced the release of PortVision DX management software for its RocketLinx and DeviceMaster lines of industrial communications products. The new software, building on the success of PortVision Plus, includes a number of feature enhancements an the addition of full support for the RocketLinx industrial Ethernet switch product line. Released with support for all current Microsoft operating systems including Windows 8, PortVision® DX enables one to remotely discover, configure, monitor, and manage Comtrol’s RocketLinx and DeviceMaster products from a single application. A detailed GUI interface, customizable notes, interactive help, basic and advanced network settings, and easy user guide access are all features which enable administrators using PortVision DX to simplify installation and management of a single switch or a large network deployment. PortVision® DX management software is a free download for all new and existing users of Comtrol RocketLinx and DeviceMaster products. For more information and a download link, please visit www.comtrol.com/portvision-dx. Winter is setting in, the days have gotten shorter, and the nights longer. After a long cold day you find yourself lying in bed staring at the ceiling. You start thinking about the day’s events and as you drift off somewhere between consciousness and sleep, you start to think about a project that you did this past summer where you deployed several outdoor 802.3at PoE+ cameras for a good customer of yours. The thought of a summer project brings warm thoughts of fishing, camping and swimming… and your mind goes back to the project. You wonder, how are those cameras holding up as each passing day gets colder and colder? You bold upright in bed in a cold sweat. Did I ever check to see if the cameras’ heaters came on?? 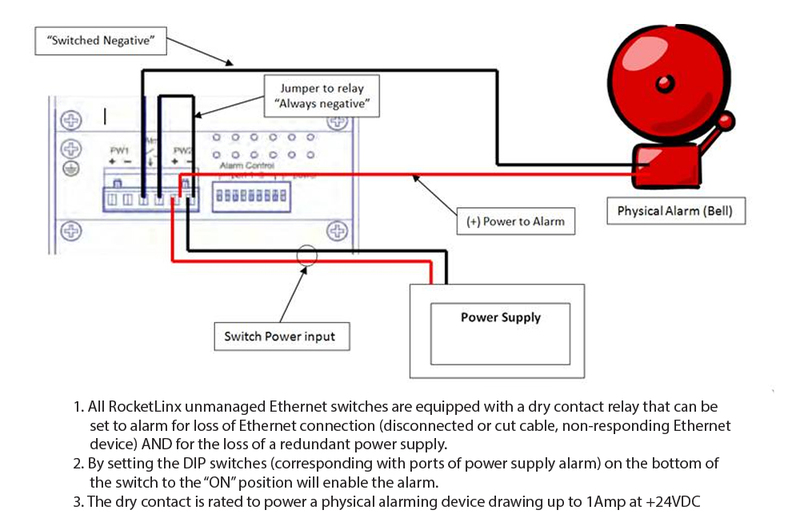 Comtrol provides alarm conditions with dry contact relays! Comtrol’s RocketLinx® line of unmanaged, industrial Ethernet switches are bringing new features to unmanaged switch users. A typical unmanaged Ethernet switch is expected to do one thing – provide Ethernet connections – which is a job most any switch can do. As the number of Ethernet devices is growing daily and expectations of the networked device continuing to rise, we believe the unmanaged switch should do more. Whether in an industrial control panel connecting Ethernet based sensors or PLCs, or in a surveillance application connecting IP cameras, the truth has become simple… expect no failure, and demand a quick fix. Each time an Ethernet device is offline, the resource is wasted. A camera is only as useful as the ability to connect its image to the user – an electrical connection that requires, at the bare minimum, power and physical connections to the transmit. If power in the switch is lost, the image won’t make it past the camera. If an Ethernet connection is lost from either end or even cut in the middle, the image will quickly disappear. How can you quickly, easily and economically protect against the above problems? An interesting application of the age-old concept: Dry contacts. Every unmanaged Comtrol RocketLinx switch has the user-configurable capability to set a dry contact alarm via DIP switch selection. Is it really that simple? Yes, by toggling a port’s associated DIP switch to the “ON” position, you have created an alarm condition specific to that port. 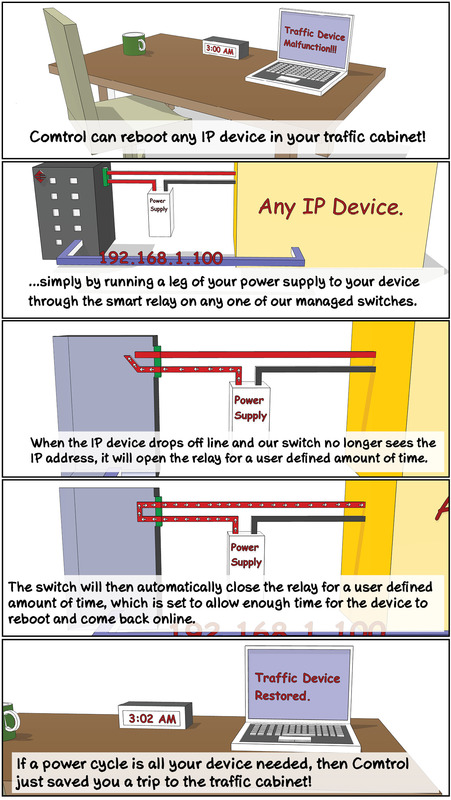 Pull an Ethernet cord from either device – circuit closes. Cut the Ethernet cord in the center – circuit closes. Main power supply failure – circuit closes. What can you do once the circuit is complete? 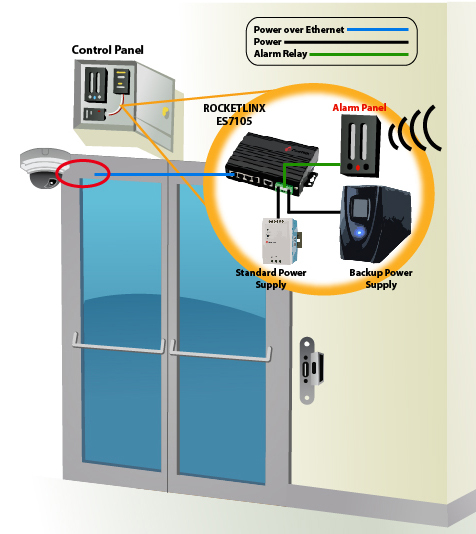 The RocketLinx dry contact alarm circuit is rated up to +24VDC at 1Amp, so you can power any physical device such as a bell or light stack to indicate the exact port of failure, or even wire in the output into an alarm panel where your options really open up. Dry contacts are simple; so is this system. How much does this feature cost? 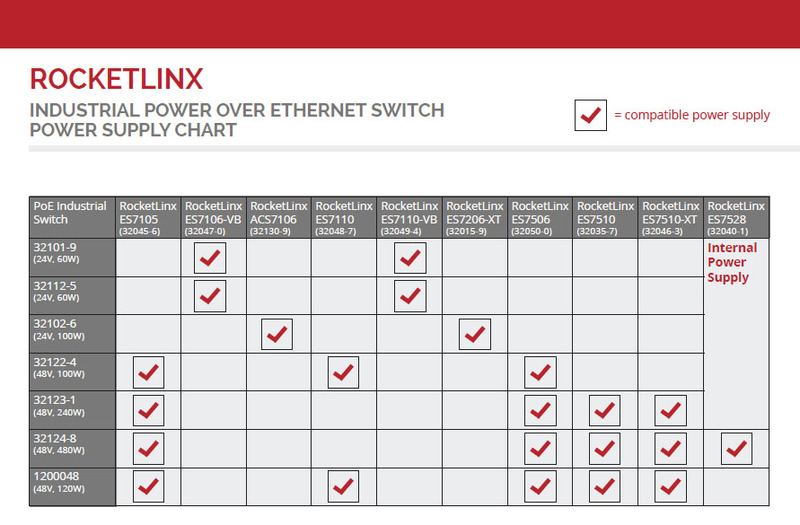 These contacts are included on every unmanaged RocketLinx Ethernet switch. Ask your Comtrol sales rep to try one today! Need more network management? 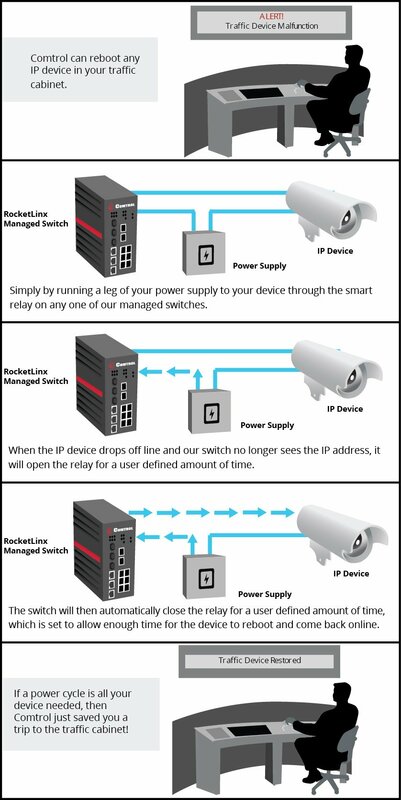 Check out our managed RocketLinx switch line! 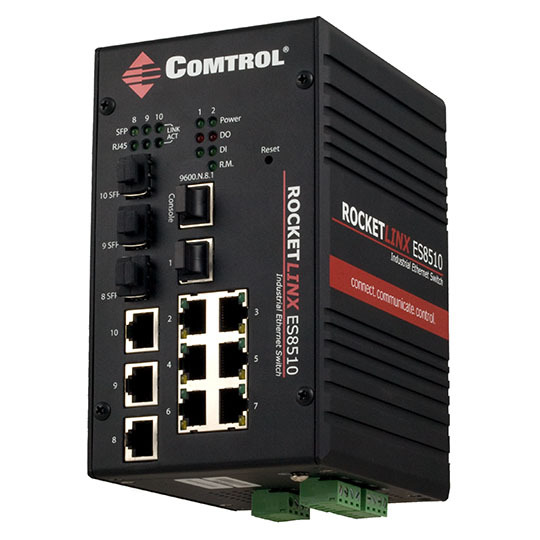 MINNEAPOLIS, Minnesota – July 11, 2012 – Comtrol Corporation, a leading manufacturer of industrial device connectivity products, today announced the release of the RocketLinx ES9528-XT Layer 2 switch to its industrial Ethernet switch product line. The RocketLinx ES9528-XT is a fully managed industrial-grade rack mount switch equipped with 24 10/100BASE-TX Fast Ethernet ports and four Gigabit Ethernet RJ45/SFP combo ports. The switch is ideally suited for control rooms and traffic applications where its high port density, fan-less design and extended operating temperature range extend reliability beyond that of common IT-grade switches.